A dream come true. This is what Frank Verlizzo, aka Fraver, has been living. Evidence of this appears on each page of his book Fraver by Design—part documentary, part autobiography, part exhibition catalogue, and part curriculum vitae. Growing up in Manhattan and exposed to great cinema and Broadway theater, from an early age Verlizzo wanted to create the art that promoted these magical and enchanting productions. He was able to attend the High School of Art and Design on East 57th Street, study advertising and illustration at Brooklyn’s Pratt Institute, and have legendary poster artist David Edward as a mentor to help launch his professional career. He landed a position with theatrical advertising agency Blaine Thompson where he participated in the production ins-and-outs of building ad campaigns for new shows. He honed his skills watching Morris Robbins prepare designs for Funny Girl, How to Succeed in Business Without Really Trying and Hello, Dolly! Graphic artist Gilbert Lesser was also influential with his Equus, Frankenstein, and The Elephant Man designs. The first poster he designed was for Travesties, which won the Best Play Tony Award (1975), and marked Fraver (as he signs his work) as a go-to illustrator and designer. From then on Fraver’s list of projects, awards, successes and contacts grew and grew. He tackled projects all over Manhattan’s theater scene, like his subtitle indicates, from Broadway, Off-Broadway, and Beyond. Chances are, if there is an amazing, stunning, or captivating Broadway poster, Fraver is behind it. Neil Simon’s I Ought to be in Pictures, Nora Ephron’s Imaginary Friends, Tennessee Williams’ Night of the Iguana, The Gershwins’ My One and Only, Disney’s The Lion King, Sondheim’s Sunday in the Park with George, Rodgers & Hammerstein’s The King and I, yes, these are all from the artistic mind of Fraver. Not just these scant seven, but hundreds of others as well have sprung up from the bottomless well of Faver’s imagination. And it’s not just the final printed selections of poster art that he has created. For every image that makes it into production Fraver has actually created several finished pieces as options for his clients to mull over. Several of these “rejected” pieces are every bit the fine art as the final selections. Such as with Follies, Fraver created 12 different posters for his presentation. Four of them are included in this collection, giving the reader an idea of the process Fraver uses for connecting with the artistic team. As Fraver narrates each poster the reader gets a sense for his congenial personality, which allows him to navigate the potential pitfalls and egos of advertising. He understands the power of the poster as the first exposure the public will ever have to each new show. The design of the poster must sell the right message . . . and tickets. Fraver has been extremely successful in this regard, which explains why he’s been around so long, cranking out work in his behind-the-scenes niche. 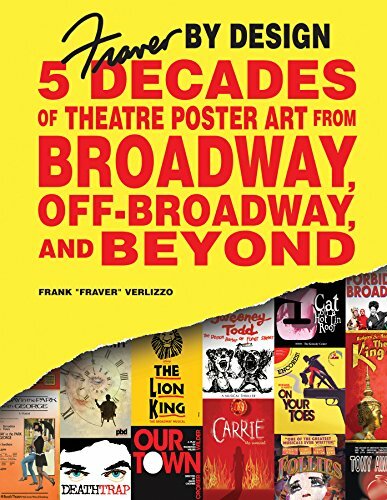 While this collection of poster art is undeniably impressive, a must have for any theater lover, what really shines through the pages is Fraver’s love and enthusiasm for what he does. He is living proof that dream careers really do exist and are obtainable with the right combination of talent, hard work, and networking. Above it all though, Fraver has poured his heart, soul, and personality into his calling, and the reader will come away from this book inspired to do the same.